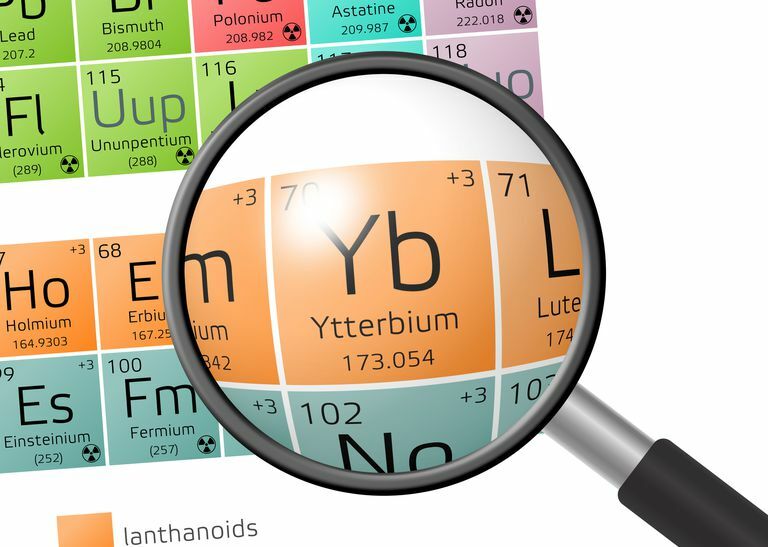 Like other rare earth elements, ytterbium isn't really all that rare, but it did take scientists a long time to figure out how to separate the rare earth elements from one another. During this time, it was rare to encounter them. Today, rare earths are common in everyday products, particularly in monitors and electronics. Ytterbium was one of the elements isolated from the mineral yttria. These elements derive their names from Ytterby (e.g., Yttrium, Ytterbium, Terbium, Erbium). For about 30 years, it was difficult to distinguish the elements from each other, so there was confusion about which element belonged to which name. Ytterbium went by at least four names, including ytterbium, ytterbia, erbia, and neoytterbia, when it wasn't altogether confused with another element. Credit for discovering ytterbium is shared between Jean-Charles Gallisard de Marignac, Lars Fredrik Nilson, and Georges Urbain, who identified the element over a period of several years, starting in 1787. Marignac reported the elemental analysis of a sample called erbia in 1878 (isolated from yttria), saying it consisted of two elements he called erbium and ytterbium. In 1879, Nilson announced Marignac's ytterbium was not a single element, but a mixture of two elements he called scandium and ytterbium. In 1907, Urbain announced Nilson's ytterbium was, in turn, a mixture of two elements, which he called ytterbium and lutetium. Relatively pure ytterbium was not isolated until 1937. A high purity specimen of the element wasn't made until 1953. Uses of ytterbium include use as a radiation source for x-ray machines. It is added to stainless steel to improve its mechanical properties. It may be added as a doping agent to fiber optic cable. It is used to make certain lasers. Ytterbium and its compounds are not normally found in the human body. They are estimated to be of low to moderate toxicity. However, ytterbium is stored and treated as if it were a highly toxic chemical. Part of the reason is that metallic ytterbium dust presents a fire hazard, evolving toxic fumes as it burns. A ytterbium fire can only be extinguished using a class D dry chemical fire extinguisher. Another risk from ytterbium is that it causes skin and eye irritation. Scientists believe some ytterbium compounds are teratogenic. Ytterbium is a bright, shiny silver metal that is ductile and malleable. The most common oxidation state of ytterbium is +3, but the +2 oxidation state also occurs (which is unusual for a lanthanide). It is more reactive than the other lanthanide elements, so it is generally stored in sealed containers to keep it from reacting with oxygen and water in air. The finely powdered metal will ignite in air. Ytterbium is the 44th most abundant element in the Earth's crust. It is one of the more common rare earths, present at about 2.7 to 8 parts per million in the crust. It is common in the mineral monazite. 7 natural isotopes of ytterbium occur, plus at least 27 radioactive isotopes have been observed. The most common isotope is ytterbium-174, which accounts for about 31.8 percent of the natural abundance of the element. The most stable radioisotope is ytterbium-169, which has a half-life of 32.0 days. Ytterbium also displays 12 meta states, with the most stable being ytterbium-169m, with a half life of 46 seconds. Word Origin: Named for the Swedish village of Ytterby. What Is the Element Uranium Used For? What Do You Know About Iron? How Much Do You Know About the Element Tennessine?